by $500 fine, a year in prison, or both." Once I made the final decision Monday night to run the Vermont 100-miler this weekend I was relieved knowing that I wouldn't have to deal with 25 more miles of rocks on the AT today! Our mapping software indicated the drive to our campground near Quechee, VT would take about 7� hours from Port Clinton. PA. We thought we'd spend the morning running some errands, then hitch up the camper and drive about half way in the afternoon. Jim had found a Cabela's nearby on Monday. I love their huge sporting goods stores and needed to find some new shoe inserts, so we went there first on Tuesday morning. We don't hunt but we enjoy looking at the dozens of stuffed critters these stores have on display - deer, bears, exotic species we've never heard of, even a moose. I found some Spenco inserts made for heavy-duty hiking that I hope will work OK for me on the Trail once my custom orthotics totally self-destruct. They are breaking down fast and may well be causing some of the knee problems I've been having recently. The rocks on the AT certainly sped up their demise (orthotics AND knees!). I may have new orthotics cast when I return to Roanoke at the end of the adventure run; it's too late to get them now. I'll use the old orthotics in the VT100. 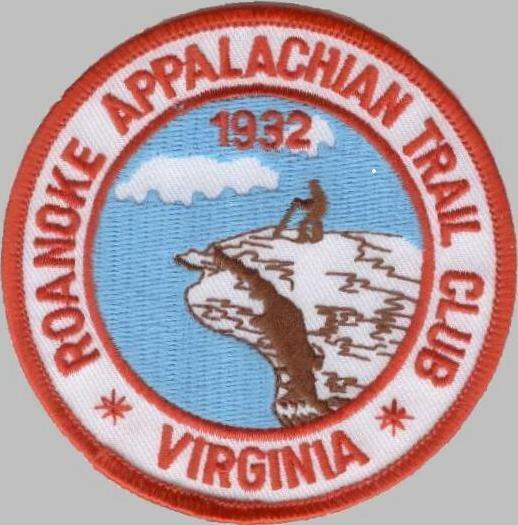 We also ordered some parts we need for the camper from an RV dealer (since we'll return to Port Clinton next week), looked in the Appalachian Outfitters store a block off the AT in town (15 % discount to thru-hikers), and visited the headquarters of the Reading Blue Mountain & Northern Railroad. These are the train tracks I crossed Monday when I came down the steep hill into Port Clinton. The small company serves nine counties in eastern Pennsylvania (freight line, not passengers). 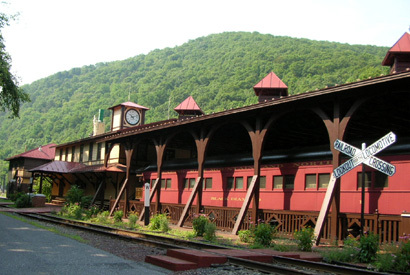 Although they built their headquarters in the 1990s, they designed the "depot" (corporate offices), train shed, and other buildings to look like an old-fashioned passenger train station from the 1800s. There are vintage signs, street lights, and other memorabilia from that era. Train buffs would enjoy visiting the park-like setting. After an early lunch on Tuesday we hitched up the camper and headed north. There weren't any campgrounds handy half way to Vermont so we kept on going to our destination between White River Junction and Quechee Gorge, Pine Valley RV Resorts. This is a very nice campground with reasonable prices (especially with a Good Sam discount or weekly rate) for all the amenities it offers. Although we arrived two days before our reservation was booked we got the same beautiful campsite we were assigned for the weekend. 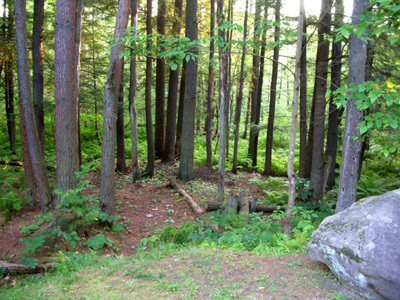 It's great - lots of space on either side, shady pine and deciduous trees, nice grass, and a beautiful woods adjacent to our site (photo below) where the dogs can run. We'll enjoy a week here! We'll stay here again in a few weeks when I get to this section of the AT (it's just north of here). This is a wonderful area of the country for a family vacation. There are so many things to do here in the summer and fall, from driving around looking at the lovely farms and covered bridges to shopping to historical sites to visiting maple sugar operations. I've been here three times now for this race during July, but not in autumn. I think it'd be gorgeous then for a race or vacation. And there's skiing at Killington and other resorts in the winter . . .
On Wednesday Jim and I relaxed, did some shopping, and worked on our pace charts and drop bag lists for the race. The temps are cooler than in Pennsylvania and there was a nice breeze all day. Hope the weather on Saturday and Sunday is this nice during the race. Jim likes to try local micro brews. He found some "Blackbeary" (blackberry-flavored) wheat beer made by the Long Trail Brewing Company of Vermont. The Long Trail is a very popular trail for back-packers. 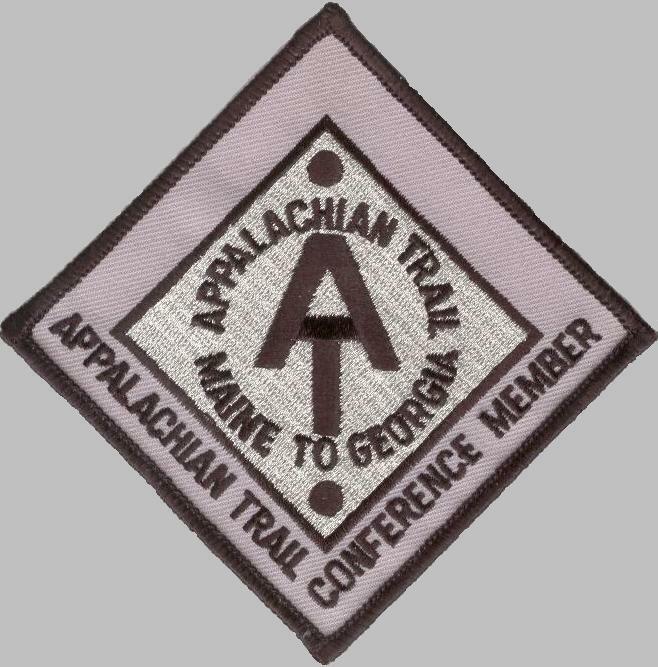 Some folks use it to "train" before thru-hiking a longer trail like the AT. 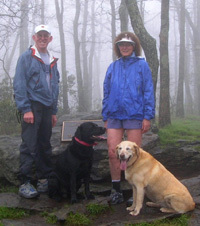 The AT shares about 105 miles with the Long Trail in Vermont before branching off to the east near Killington. I almost did twelve miles on the Appalachian Trail up here on Wednesday, then thought better of it. I'm supposed to be resting for the race, after all. Jim was getting cabin fever Thursday, however, so we decided to walk just a little bit of the Trail on VT 12 north of Woodstock. It was easier to find parts of the VT100 course with its course markers - yellow pie plates with arrows - already in place. When we finally found the AT road crossing we scrunched our truck into a teensy parking lot and took the dogs for a brief walk. The direction we chose was seriously uphill through fields that were hot in the noon-time sun. You can see the white AT blaze on the tree near the family. I can say I've done part of the AT in Vermont but since it was only a short out-and-back, I'll be doing it again! On Thursday we did some driving around to find the horse farm (Silver Hill) where the race begins. It's a couple miles from Smoke Rise, where the race used to be headquartered when I've done it previously (1998, 2000). There was a huge tent set up and parking signs directing vehicles, RVs, and horse trailers. Yes, this is also an endurance horse race! In 1998 there were concurrent 50- and 100-mile horse races while the runners did 100 miles. Much of the course was the same. In 2000 the horse races were scheduled a different weekend, and I really missed them. They can be a bit of a hazard to the runners (I almost got my foot stepped on in a narrow trench of a trail when a horse passed me), but they are a wonderful distraction, too. I'm glad they'll be running with us again this year. We saw several parts of the race course as we were driving around the area. About 70 miles are on dirt roads, a couple miles on pavement, and the rest on trails. We run through two bridges, Taftsville and Lincoln (?). 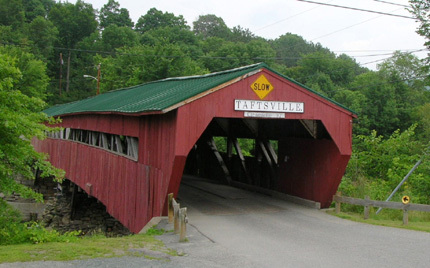 Although Jim paced me the last 32 miles in 2000, he didn't get to run through the bridges, so we visited the Taftsville bridge (photo above) after checking out the race start/finish area. I'm more psyched up about running the race after getting up here and seeing parts of the course again. I just love this area! We also went back to Sugarbush Farm, just off the race course, famous for its delicious pure maple syrup (they tapped about 5,000 of their trees in 2004) and waxed bars of cheese. We've shopped there previously and loved their products, so we stocked up on some more. Yum! If you want to check out their products, their website is www.sugarbushfarm.com. Since we've spent a bunch of time this week working on pace charts and drop bags, let me describe the process to those readers who aren't familiar with trail ultras. Most ultra races allow runners to have supplies of their own at certain aid stations. Some runners don't use them, especially if they have a crew. Jim and I use drop bags even if one of us is crewing the other, because "stuff happens." The crew person can miss the runner for any number of reasons, including a flat tire or other emergency, getting lost, runner going faster than expected, and so on. Even if something happens to the crew person, the runner still has drop bags where planned. The Vermont 100 website has two different pages with discrepancies of drop bag sites so we won't be able to finalize our drop bags until after getting the official race information Friday morning. Usually we know exactly where the drops are allowed well before race day. Jim and I probably spend more time determining where to put drop bags and what to put in each than we do actually packing the items we put in our boxes. The first step is making a laminated pace chart with drop bag locations, our expected times for selected aid stations, and official cut-off times at certain aid stations. We each carry one of these small charts with us in the race so we'll know how we're doing at any given point. Then we have to figure out where we want drop bags so we can re-supply regularly with Hammergel, energy drink powders, and electrolyte caps; leave or pick up warm clothes and lights; have clean socks and another pair of shoes; etc. This is more of a problem for us than usual since our training hasn't been the best for this race and we don't have a clear idea what our paces will be. We're both assuming we'll be close to the cut-offs and just want to beat the 30-hour time limit this year (I finished in 28:35 here five years ago; Jim hasn't run it, but would probably finish in 23-24 hours with decent training). We use clear plastic storage boxes with lids secured by bungee cords. Since the boxes are rigid, items inside don't get banged up from handling in transit and at aid stations and it's easier to find what we need inside than with a canvas duffel bag that zips closed. The plastic boxes also keep things dry if it rains. We see more and more plastic boxes being used in races now. We did the hard work Wednesday: getting our lists ready. Thursday we packed the boxes with the things that can go into them early; Friday we'll take them to race HQ and add them to the piles of other runners' drop bags. It's an act of faith, I suppose, but we've never had problems in any race with our drop bags/boxes not making it to the right aid station. We used our lights at night to finalize our decision re: which ones to use at the start and during the night, and Jim tested all the batteries to make sure we have enough fresh ones for the lights and for spares. Since it will get light so soon after the 4 AM start we'll use little Photon LED micro-lights at the beginning of the race and keep them as our emergency (back-up) lights during the night. I did this here in 2000 and it worked fine. At night we're both using Streamlight 7-LED hand-held lights. I have difficulty seeing at night so I'm also using a Photon Fusion 6-LED headlamp that I wear around my waist (bounces less that way and I don't get "tunnel vision"). We will carry four spare AA batteries in case one of our lights goes out. We also put spare lights in our night drop boxes because you never know what might happen out there. We've got a pile of lights after doing hundred-milers for seven years so we may as well use them. Folks put so much time and energy and money into running these races that it's important to cover the "little stuff" like lights and foot care. If your light goes out and you aren't prepared with a back-up, or if you get a hot spot and let it develop into a blister, your race can come to a screeching halt. Gotta be prepared. I won't be writing another entry until Monday or Tuesday. I'll include the pre-race activities on Friday and the race on Saturday and Sunday. Some races have live web casts that allow viewers to check up on runners' progress, but I don't think the Vermont site does. 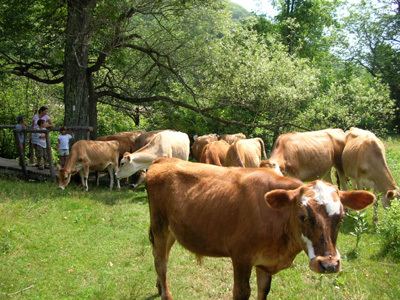 If you'd like to see the site, go to www.vermont100.com. Hope I'll have good news to report next time. Keep your fingers crossed!